Ethiopian government in their second Growth and Transformation Plan (2015-16 to 2020-21) pledged to improve the country's infrastructural scenario on the back of robust foreign investment in the construction sector. Chinese contractors have gained a foothold in the country due to cheap labor and resources bagging multi-million projects from the government and has further paved the way for the robust growth of air conditioner market. Wall mounted air conditioner segment acquired majority of the overall Ethiopia AC Market share due to affordable prices and complications in installation of window air conditioners in high floored apartments and closed spaces. Floor standing air conditioner segment is expected to register a healthy growth in future due to lesser complexities in its installation and after sale services. Residential, commercial and retail applications garnered the maximum of the revenue share from the air conditioner sales due to rapid commercialization of the urban areas of Addis Ababa and near-by regions. The government's decision to shift a significant number of offices in the region along with the recent completion of African Union headquarters and construction of Chuan Hui international tower given this sector a timely boost. The Ethiopia AC market report thoroughly covers the air conditioner market by AC types, applications, and regions. 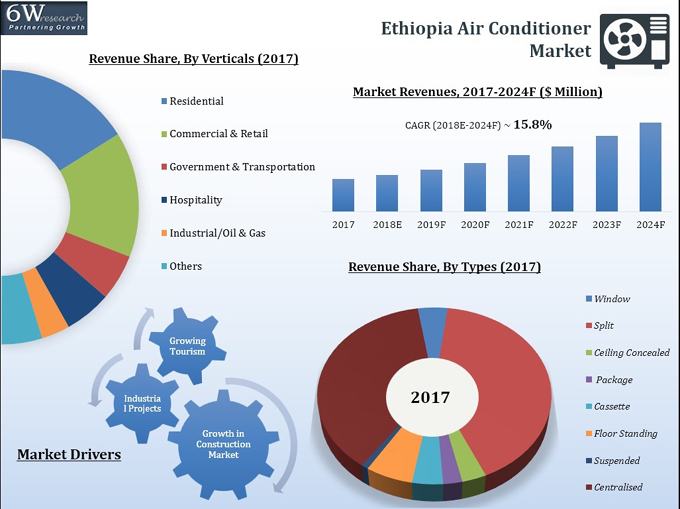 The Ethiopia AC market outlook report provides an unbiased and detailed analysis of the Ethiopia AC market trends, opportunities/high growth areas and market drivers which would help the stakeholders to decide and align their market strategies according to the current and future market dynamics. 19.1. Samsung Electronics East Africa Ltd.
19.6. GREE Electric Appliances Inc.